Like the saying “it’s what’s inside that counts” teaches us not to judge people by their looks alone, learning how to analyze social media data is about more than just vanity metrics, i.e. the likes and clicks your campaign posts generate. Measuring social media analytics requires a comprehensive strategy that takes into account all channels in the funnel, in real time, in order to help you determine the best path to success. You need to see how engagement and click-thrus on social media, along with website engagement and sales data, all relate to one another in order to connect the dots between content and conversion. Why analyze social media data? 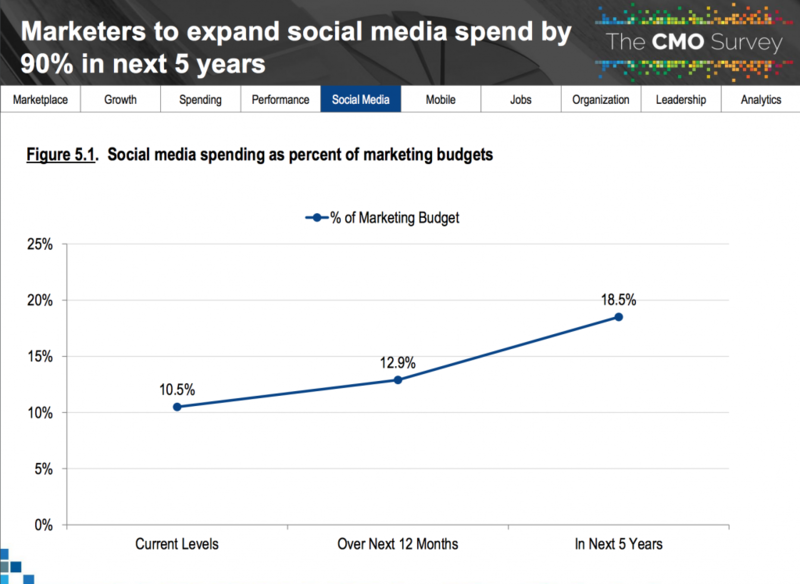 By 2020, social media spending is expected to account for 18.5 percent of an average company’s marketing budget – up from 10.5 percent this year, according to the CMO Survey. Social media marketing is already nearing 100 percent adoption in the highest ranks of U.S. businesses. Yet, according to the CMO Survey, only 11.5 percent of marketing executives say they can prove the business impact of social contributions to profitability. In order to justify a social media budget, marketers must be able to prove their return on investment (ROI). Forrester Research reports that marketers who link metrics to business results are three times more likely to hit revenue goals than those who don’t. That’s a compelling number. Analyzing data in real time provides an opportunity to make informed decisions, and to assess and adjust a social campaign to optimize your spend. Find out which channels are driving business results and which respond best to different content and campaigns, to make investments based on where you’ll drive the most conversions and revenue. See the big picture rather than taking a siloed approach. Analyze social media data across all social channels in which you and competitors participate, like Facebook, Twitter, Instagram, LinkedIn, and Pinterest, and look at how they relate to one another as well as to other analytics, like website activity, and data from marketing automation and CRM tools. TrackMaven’s platform can prove ROI and improve performance on 18 digital channels, including all of those mentioned above. Then, determine how they relate back to factors like sales, leads, and revenue generation and conversion. 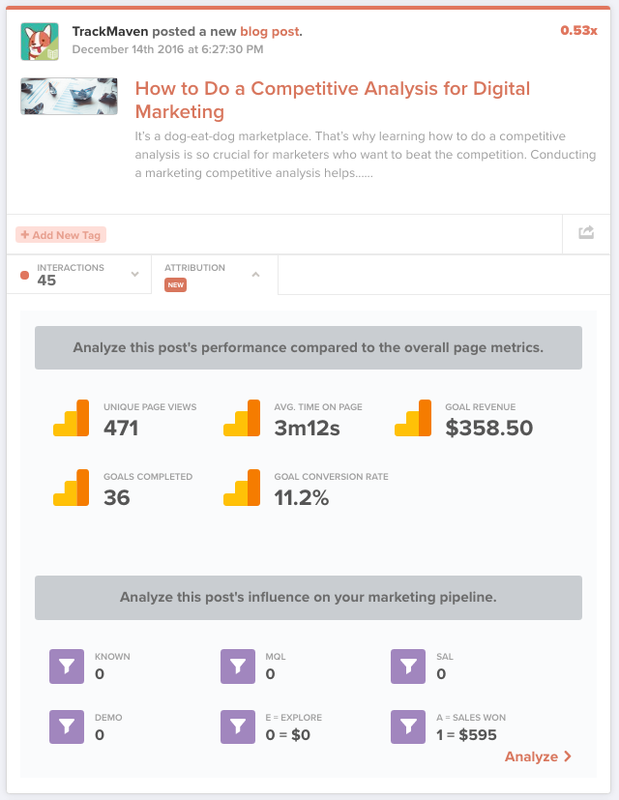 Compare results to competitors, influencers, and industry benchmarks. How do you measure up on metrics like average social media audience size, average number of blog posts published per brand per month, and average number of social shares or press mentions per blog post? It’s also worthwhile to determine your website health by tracking your Moz Domain Authority over time. The 2017 Digital Marketing Analytics Report, for example, found that within the consumer goods industry, the food and beverage sub-industry gets the most top-of-funnel impact from blog posts, while consumer electronics get the best impact from press mentions. 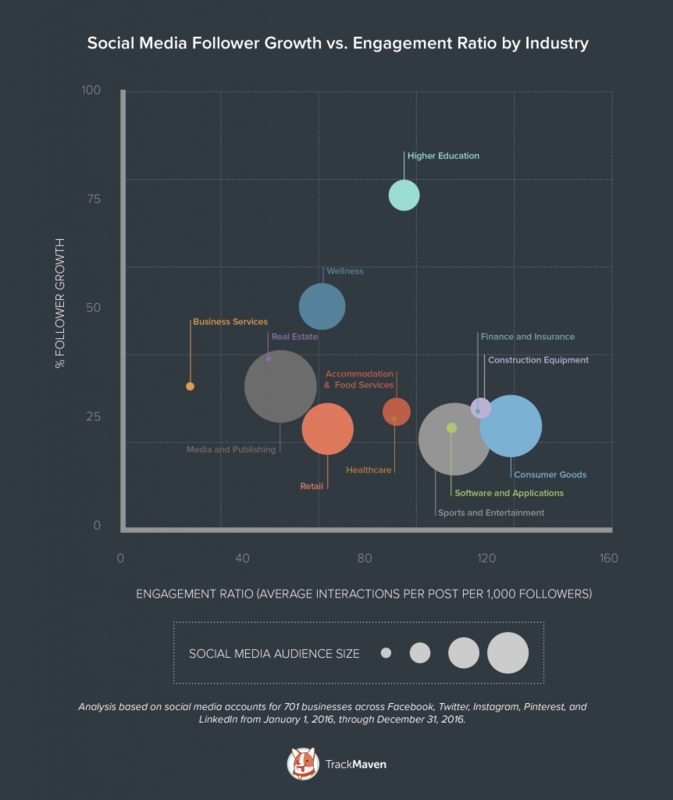 Higher education brands see their biggest audience on Twitter, but Instagram is their most engaging social network; while Instagram shows both the biggest audience and most engagement for retail brands. It goes even deeper: the average number of blog posts per month for consumer goods, for example, is 23, with an average of 221 social shares for each one. On average, these businesses receive 713 press mentions per month, and 83 social shares per press mentions. The biggest social media audience is about 330,000 and the smallest is about 10,000. The most engaging social network is Instagram, and the least is Twitter, behind even LinkedIn and Pinterest. That’s the kind of granular data you can get with a good analytics platform. With TrackMaven’s platform, you can also track which Facebook posts are promoted and which are organic, and compare the performance of these types of content. This not only provides useful insight, but you can see which organic campaigns could benefit from monetary support. Use a tool that can generate customized reports and track how your social media efforts contribute to business performance, and provide it in a format you can export like a PowerPoint presentation or PDF, and share with your team. Analytics tools for social media can measure factors like competitive and campaign analysis, social media ROI, omni-channel, real-time and integrated analytics, and more. These reports can tell you things like how social traffic affects conversions; how different channels perform for different brands; which topics perform best on each channel; and even which times and days of the week are best to post. Just as important as measuring the sales, leads, and conversions social media generates is being able to attribute these to the correct sources and stages within the funnel. Knowing which campaign, channel, or post played a role in a final purchase decision lets you strategize more efficiently. Social media data isn’t just about quantifiable statistics: measure sentiment analysis, which leverages machine learning and natural language processing to understand human attitudes toward your brand. For example, while lots of online chatter about your brand might seem like a good thing, how do you know if the conversations are generally positive or negative? This adds context to the equation, and can lead to better social incident response, i.e. the use of social media for the purposes of customer service and incident management. Tying social media to business outcomes is crucial. Altimeter found that of the 56 percent of those who report not being able to make this connection, 39 percent attribute it to a lack of analytics, expertise, and resources, 38 percent to the use of poor tools, 35 percent to inconsistent analytical approaches, and 30 percent to unreliable data. All these issues can be easily rectified with the right marketing analytics tool. A study conducted by the IAB found that on average, brands only use 3.5 metrics to gauge social campaign performance: click-thrus, traffic, and engagement. A comprehensive marketing analytics tool with a single, centralized view of performance across all social networks and distribution channels can bring these elements together and provide useful and contextual data to help you determine the most effective social ad strategy, and allocation of budgets. Want to uncover digital marketing benchmarks for your industry? Download your free copy of the 2017 Digital Marketing Analytics Performance Report now! 2017 Digital Marketing Analytics Performance ReportYes! I want my free copy! Social Listening vs. Social Media Analytics: What’s the Difference?